For the Russian fairy tale Father Frost, see Father Frost (fairy tale). Ded Moroz (Russian: Дед Моро́з [dʲɛt mɐˈros], Belarusian: Дзед Мароз, Ukrainian: Дід Мороз, diminutive Dedushka Moroz Russian: Дедушка Мороз) is a Slavic fictional character similar to that of Father Christmas. The literal translation is "Old man Frost", often translated as "Grandfather Frost". Ded Moroz brings presents to children and often delivers them in person on New Year's Eve. Ded Moroz is accompanied by Snegurochka (Russian: Снегурочка, Ukrainian: Снігуронька, "Snow Maiden"), his granddaughter and helper, who wears long silver-blue robes and a furry cap or a snowflake-like crown. She is a unique attribute of Ded Moroz, since similar characters in other cultures don't have a female companion. Ded Moroz wears a heel-length fur coat, a semi-round fur hat, and valenki on his feet. He has a long white beard. He walks with a long magic staff and sometimes rides a troika. The residence of Ded Moroz in Russia is considered to be the town of Veliky Ustyug, Vologda Oblast. The residence of the Belarusian Ded Moroz (Dzied Maroz in Belarusian) is said to be in Belavezhskaya Pushcha. The origins of the character of Ded Moroz predates Christianity as a Slavic wizard of winter. In Slavic mythology, Frost or Morozko is a snow demon. Under the influence of Orthodox traditions, the character of Ded Moroz was transformed. Since the 19th century the attributes and legend of Ded Moroz have been shaped by literary influences. The play Snegurochka by Aleksandr Ostrovsky was influential in this respect, as was Rimsky-Korsakov's Snegurochka with libretto based on the play. By the end of the 19th century Ded Moroz became a popular character. Following the Russian Revolution, Christmas traditions were actively discouraged because they were considered to be "bourgeois and religious". Similarly, in 1928 Ded Moroz was declared "an ally of the priest and kulak". 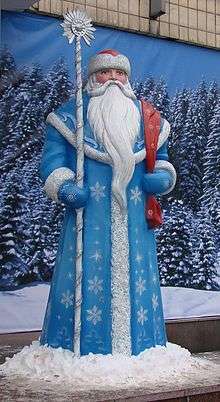 Nevertheless, the image of Ded Moroz took its current form during Soviet times, becoming the main symbol of the New Year’s holiday (Novy God) that replaced Christmas. Some Christmas traditions were revived following the famous letter by Pavel Postyshev, published in Pravda on December 28, 1935. Postyshev believed that the origins of the holiday, which were pre-Christian, were less important than the benefits it could bring to Soviet children. Ded Moroz is very popular in modern Russia. In 1998, the town of Veliky Ustyug in Vologda Oblast, Russia was declared the home of the Russian Ded Moroz by Yury Luzhkov, then Mayor of Moscow. Between 2003 and 2010, the post office in Veliky Ustyug received approximately 2,000,000 letters from within Russia and from all over the world for Ded Moroz. On January 7, 2008, then President Putin of the Russian Federation visited Ded Moroz' residence in the town of Veliky Ustyug as part of the Russian Orthodox Christmas Eve celebration. 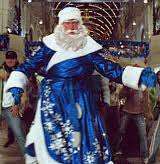 The western Santa Claus made inroads in the Russian Federation during the "turbulent" 1990s when Western culture increased its penetration into the post-Soviet Russia. The resurgence of Russia in the early 21st century brought about a renewed emphasis on the basic Slavic character of Ded Moroz. This included the Russian Federation and subordinate governments sponsoring courses about Ded Moroz every December, with the aim of establishing appropriate Slavic norms for Ded Moroz and Snegurochka ("Snow Maiden" - Ded Moroz' granddaughter) roles for the New Year holiday. People playing Ded Moroz and Snegurochka now typically make appearances at children's parties during the winter holiday season, distributing presents and fighting off the wicked witch, Baba Yaga, who children are told wants to steal the gifts. In November and December 2010, Ded Moroz was one of the candidates in the running for consideration as a mascot for the 2014 Winter Olympics in Sochi, Russia. Many ethnic minorities in Russia also have names in their languages for Ded Moroz. For example, in Bashkir and Tatar, Ded Moroz is known as Ҡыш бабай (Qïš babay, literally: "Winter Old Man"). In Yakut, he is known as Chys Khan ("Master of Cold"). In Nenets he is known as Yamal Iri ("Grandfather of Yamal"). Ded Moroz, and on occasion the Belarus Dzied Maroz, are presented in the media as being in on-going détente with various counterparts from other cultures, such as the Estonian Santa Claus (Jõuluvana or "Old man of Christmas"), the Finnish Santa Claus (Joulupukki or "Yule Goat"), and other Santa Claus, Father Christmas, and Saint Nicholas figures. The détente efforts portrayed have included one-on-one meetings, group meetings and friendly competitions, such as the annual November Santa Claus championships of Celle, Germany. The traditional meeting of Russian Ded Moroz and Finnish Joulupukki was held in 2015 despite political isolation of Russia in the West because of Ukraine conflict. In November 2009, for the first time, the Russian Federation offered competition to NORAD Tracks Santa with GLONASS Tracks Ded Moroz, which purports to use GLONASS (GLObal NAvigation Satellite System or "the Russian GPS") to track Ded Moroz on New Years Eve (according to the Gregorian Calendar). The Russian language website (a language not currently offered by the competing NORAD Tracks Santa) includes these features: "real-time tracking" of Ded Moroz, "news" of Ded Moroz throughout the year, a form to send e-mail to Ded Moroz, photos, videos, streaming audio of Russian songs, poems and verses from children's letters to Ded Moroz, information on Veliky Ustyug in Vologda Oblast (considered to be Ded Moroz's hometown) and opportunities to enter competitions and win prizes. There are equivalents of Ded Moroz and Snegurochka all over the former USSR, as well as the countries once in the so-called Eastern bloc and in the former Yugoslavia. After the Dissolution of the Soviet Union, some of these countries made efforts to move away from Soviet and Russian heritage toward their own ancient traditions. In Armenia, Ded Moroz is known as Ձմեռ Պապ ("Dzmer Pap"), which literally means "Winter Grandfather". In Azerbaijani, Ded Moroz is known as Şaxta Baba ("Grandfather Frost") and his companion Snegurochka is known as Qar Qızı ("Snow Girl"). In the predominantly Muslim but secular country, where Christians are a very small minority, this tradition remains very popular. Şaxta Baba brings gifts to children at New Year celebrations, however Qar Qızı is rarely present at the festivities. Ded Moroz is Dzied Maroz (Belarusian: "Дзед Мароз") in Belarusian language. He is not a historical folkloric Belarusian character. The official residence of Dzied Maroz in Belarus is declared to be in Bialowieza Forest. The Bulgarian name of Santa Claus is Дядо Коледа (Dyado Koleda, Grandfather Koleda), with Dyado Mraz (Дядо Мраз, "Grandfather Frost") being a similar Russian-imported character lacking the Christian connotations and thus popular during Communist rule. However, he has been largely forgotten since 1989, when Dyado Koleda again returned as the more popular figure. In socialist Yugoslavia (Bosnia and Herzegovina, Croatia, the Republic of Macedonia, Montenegro, Serbia and Slovenia) the character who was said to bring gifts to children was called "Grandfather Frost" (Bosnian: Djed Mraz, Croatian: Djed Mraz, Macedonian: Дедо Мраз (Dedo Mraz), Serbian: Деда Мраз (Deda Mraz), Slovenian: Dedek Mraz). He was said to bring gifts for the New Year because public celebration of Christmas was forbidden during communism. In Croatia fter the breakup of Yugoslavia, Djed Mraz was labeled Communist and Djed Božićnjak (literally: "Grandfather Christmas") was introduced. Attempts were made in the mass media and advertising to replace Djed Mraz with Djed Božićnjak. After 1999 the names of Djed Mraz and Djed Božićnjak became more or less synonymous, including in their use on public television. In some families Djed Mraz is still said to brings gifts at New Year. In Croatia, children also get presents on December 6. The presents are said to be brought by a traditional figure called Sveti Nikola (Saint Nicholas) who closely resembles Djed Mraz or Djed Božićnjak, except for the fact that he is accompanied by Krampus who takes misbehaving children away. In some religious families, little Jesus (Isusek, Mali Isus, Kriskindl) is said to brings gifts at Christmas instead of Djed Božićnjak. A man dressed as Dedek Mraz in Slovenia. In Slovenia the name Ded Moroz was translated from Russian as Dedek Mraz (literally, "Grandpa Frost"). Dedek Mraz is depicted as a slim man wearing a grey leather coat, which has fur inside and is decorated outside, and a round dormouse fur cap. This version of the character is based on traditional imagery, especially as depicted by Maksim Gaspari in images commissioned in 1952. Although the name was translated literally from the Soviet figure, other names for the character were also considered: Sneženi mož (the Snow Man) and oca Triglav (Daddy Triglav). A female figure names babica Zima (Grandma Winter) was also proposed. Initially he was said to live in Siberia, but with the Informbiro crisis and the schism between Yugoslavia and the Soviet Union his home was relocated to Mt. Triglav, Slovenia's (and also Yugoslavia's) highest peak. Public processions featuring the character began in Ljubljana in 1953. The notion of Grandpa Frost was ideologically useful because it served to reorient the December/January holidays away from religion (Saint Nicholas Day and Christmas) and towards the secular New Year. After the ousting of Communism at the beginning of the 1990s, two other "good old men" (as they are currently styled in Slovenian) reappeared in public: Miklavž (Saint Nicholas) is said to bring presents on December 6, and Božiček ("Christmas man"; usually depicted as Santa Claus) on Christmas Eve. St. Nicholas has had a strong traditional presence in Slovenian ethnic territory and his feast day remained celebrated in family circles throughout the Communist period. Until the late 1940s it was also said in some areas of Slovenia that Christkind (called Jezušček ("little Jesus") or Božiček brought gifts on Christmas Eve. Slovenian families have different preferences regarding their gift-giver of choice, according to political or religious persuasion. Slovenian popular culture depicts Grandpa Frost, Saint Nicholas and Santa Claus as friends and has also started blending attributes of the characters, for example, mention of Santa's reindeer is sometimes mingled into the Grandpa Frost narrative at public appearances. Due to his non-religious character and strong institutionalization, Grandpa Frost continues to retain a public presence. Ayaz Ata is the Kazakh and Kyrgyz name for Ded Moroz. While there is no traditional analog of Ded Moroz in Polish folklore, there was an attempt to introduce him as Dziadek Mróz during the communist period. Communists, opposed to religion in general, considered Christmas and traditional Święty Mikołaj (Saint Nicholas) "ideologically hostile". Therefore, propaganda attempted to replace him with Dziadek Mróz (literal translation of Ded Moroz). Authorities often insisted on using the figure in schools and preschools during celebrations and events for children. This was also supposed to create an illusion of cultural links with the Soviet Union. In 1948, after the Communists gained power in Romania, it was decided that Christmas should not be celebrated. December 25 and December 26 became working days and no official celebrations were to be held. As a replacement for Moş Crăciun (Father Christmas), a new character was introduced, Moş Gerilă (literally "Old Man Frosty", a Romanian language adaptation of the Russian Ded Moroz). He was said to bring gifts to children on December 31. Officially, the New Year's Day celebrations began on 30 December, which was named the Day of the Republic, since it was the day when King Mihai I of Romania abdicated in 1947. After the Romanian Revolution of 1989, Moş Gerilă lost his influence, being replaced by Moş Crăciun. Chys Khan is known as the master of cold, accompanied by the snow maiden Khaarchana. In Tajikistan the tradition of Ded Moroz has continued. 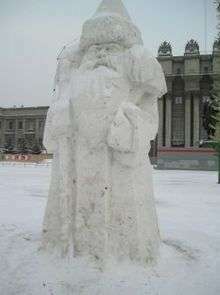 In Tajik, Ded Moroz is known as Boboi Barfi ("Grandfather Snow"), and Snegurochka is called "Barfak" ("Snowball"). In 2012, a young man dressed as Ded Moroz was stabbed to death in Dushanbe by a crowd shouting "You infidel!". The murder was motivated by religious hatred, according to the Tajik police. On 11 December 2013, Saidali Siddiqov, the first deputy head of the Committee for TV and Radio-broadcasting under the Government of Tajikistan, announced in an interview that "Father Frost, his maiden sidekick Snegurochka (Maiden Snow), and New Year’s tree will not appear on the state television this year, because these personages and attributes bear no direct relation to our national traditions, though there is no harm in them". However next day this was denounced, and planned celebrations did include these despite objections of some religious figures. 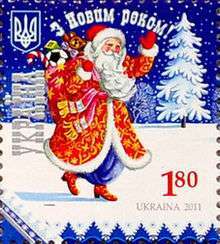 In 2014, Russian media reported the emphasis on Saint Nicholas in Ukraine as an attack on Ded Moroz and Russian culture. In 2012, Uzbekistan, a largely Muslim nation, moved away from celebrating Christmas and its historical characters. ↑ "Ded Moroz and Snyegurochka by Jocelyn and Steve Oborn, 13 Dec 2009". jocelyneandsven.blogspot.com. Retrieved 2010-11-26. ↑ "Snegurochka: The Snow Maiden in Russian Culture by Kerry Kubilius". About.com. Retrieved 2010-11-26. 1 2 "Of Russian origin: Ded Moroz". RT.com. Retrieved 2010-11-26. 1 2 3 "Ded Moroz, the Russian Santa: Ded Moroz, or 'Grandfather Frost' is Russia's Santa Claus by Kerry Kubilius". About.com. Retrieved 2010-11-26. 1 2 "Meet Russia's Antidote To Santa". CBSNews. 24 December 2007. ↑ "Christmas Customs in Eastern Europe: Eastern Europe's Traditional Christmas Celebrations by Kerry Kubilius". About.com. Retrieved 2010-11-26. ↑ "Father Frost and the Snow Maiden deliver Russia's winter warmer, by Helen Womack, 31 December 1996". London: The Independent. 1996-12-31. Retrieved 2010-12-12. 1 2 3 "Reveling in Russian Santa's fairytale home, by Phoebe Taplin, 15 Dec 2010". Russia: Beyond the Headlines. Retrieved 2010-12-15. ↑ "Veliky Ustyug, the Russian Santa's Home by Kerry Kubilius". About.com. Retrieved 2010-11-27. ↑ "Veliky Ustyug - Homeland of Father Frost". Vologda Oblast. Retrieved 2010-11-27. ↑ "Putin and his deputy show off Russian Christmas traditions, 7 Jan 2008". Deutsche Presse-Agentur. Retrieved 2010-11-27. ↑ "Russia's Grandfather Frost fights the invading Santas, Dec 24, 2000 by Fred Weir". London: The Independent. 2000-12-24. Retrieved 2010-11-27. 1 2 "Meet Russia's Antidote To Santa, Dec 25, 2007 by Dave Grout, CBS News". CBS News. 2007-12-24. Retrieved 2010-11-25. ↑ "Santa Claus is an 'illegal immigrant' declares top Kremlin official in Christmas 'Cold War' by Will Stewart – Dec 5, 2008". London: Daily Mail. 2008-12-05. Retrieved 2010-11-27. ↑ "Video - Meet Russia's Antidote To Santa, Dec 25, 2007 by Dave Grout, CBS News". CBS News. Retrieved 2010-11-25. ↑ "Moscow school set to instruct a new generation of Santas, RIA Novosti, Dec 6, 2005". RIA Novosti. Retrieved 2010-11-25. ↑ "Father Frost: History". Russian Santas. Retrieved 2010-11-25. ↑ "Estonia/Russia: Santa Claus Shakes Hands With Father Frost, Jan 1, 2006". Radio Free Europe and Radio Liberty. Retrieved 2010-11-25. ↑ "Russian Father Frost expects to celebrate Christmas in London, Nov 24, 2010". Interfax. Retrieved 2010-11-25. ↑ "Finnish Santa Claus and Belarusian Father Frost, Nov 22, 2010". Official Website of the Republic of Belarus. Retrieved 2010-11-25. ↑ "Ded Maroz ('Father Frost') meets Santa Claus in Turku, Finland, Dec 31, 2008". YouTube. Retrieved 2010-11-25. ↑ "Vologda Oblast Press Release: Ded Moroz Presides Over the Annual International Santa Claus Championships of 28–29 November 2009 in Celle, Germany – Nov 27, 2009". Vologda Oblast. Retrieved 2010-11-27. 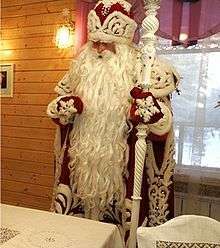 ↑ "Vologda Oblast Press Release: Ded Moroz Participates in Annual International Santa Claus Championships of 28–29 November 2008 in Celle, Germany – Nov 27, 2008". Vologda Oblast. Retrieved 2010-11-27. ↑ "Santa Claus Championships hit Switzerland and Germany – Dec 3, 2009". China Central Television (CCTV). Retrieved 2010-11-27. ↑ "What on earth is happening with "Russia's GPS"?, Dec 1, 2009 by Julia Ioffe". Fortune. Retrieved 2010-11-20. ↑ "Official GLONASS Tracks Ded Moroz website" (in Russian). Official GLONASS Tracks Father Frost. Retrieved 2010-11-27. 1 2 "Dzied Maroz". On-Line Reference and Information. Archived from the original on July 17, 2011. Retrieved 2010-11-26. 1 2 "Christmas and New Year in Belarus, 13 Dec 2007". Office for a Democratic Belarus. Archived from the original on November 23, 2010. Retrieved 2010-11-26. ↑ "Traditions old and new: From Father Frost to Father Christmas, Dec 26, 2005 by Petar Kostadinov". The Sofia Echo. Retrieved 2010-11-26. ↑ "BALKANS: Religion Makes a Worrying Call, 11 May 2009". Global Geopoltics Net. Retrieved 2010-11-26. ↑ Klobčar, Marija. 2009. Christmas Songs and Constructing Identities. Traditiones 38(1): 173–188, p. 173. ↑ Tivodar, Blanka, & Andreja Vezovnik. 2010. Cooking in Socialist Slovenia: Housewives on the Road from a Bright Future to an Idyllic Past. In: Breda Luthar & Maruša Pušnik (eds. ), Remembering Utopia: The Culture of Everyday Life in Socialist Yugoslavia, pp. 379–406. Washington, DC: New Academia Publishing, p. 396. ↑ "Santa Claus in Croatia: The Croatian Santa Clause Tradition by Kerry Kubilius". About.com. Retrieved 2010-11-26. 1 2 "Croatia Christmas Traditions: Christmas in Croatia by Kerry Kubilius". About.com. Retrieved 2010-11-26. ↑ "Slovenia's Christmas Traditions: Christmas in Slovenia by Kerry Kubilius". About.com. Retrieved 2010-11-26. ↑ "The Scent of Christmas in Romania, Dec 2006 by Magdalena Chitic". European Youth Voice. Retrieved 2010-11-26. ↑ Roman Kozhevnikov (3 January 2012). "'Father Christmas' stabbed to death in Tajikistan". Reuters. ↑ Asia-Plus (11 December 2013). "'Tajik official confirms information about banning Father Frost from New Year's broadcasts". Asia-Plus. ↑ "Kiev Brings Back Orthodox Santa Claus Instead of Soviet-Era Father Frost". The Moscow Times. 20 November 2014. ↑ "Father Christmas off air in Uzbekistan". BBCNews. 24 December 2012. Look up ded moroz in Wiktionary, the free dictionary. Wikimedia Commons has media related to Ded Moroz.